Edit: Prize Drawing Winner......the winner of my Copic prize drawing is Tessa Wise! Congratulations Tessa, I've emailed you already for you contact information! Thanks to everyone for playing along and I 'll be bringing you more Copic posts soon!! It's June 1st already, can you believe it? It's time once again for the Papertrey Senior Design Team Challenge and this month's is right up my alley. Nichole has challenged the Design Team to create homemade embellishments for a project. As you know, I've been doing a lot of this lately. The process of creating these little embellishments is so fun! Let's get started. 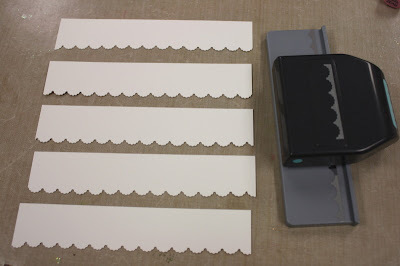 I first cut some 5-1/2" strips of Stamper's Select White Cardstock and punched the edges with a scallop border using an EK Success slim line border punch. 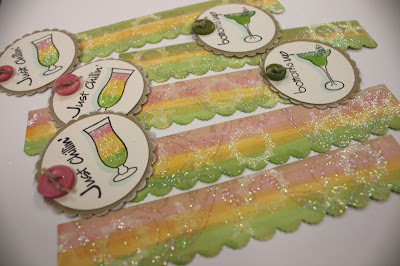 Using the fun Day at the Beach stamp set, I embossed some images onto the cardstock strips using Clear Embossing Powder. Then comes the really fun part. 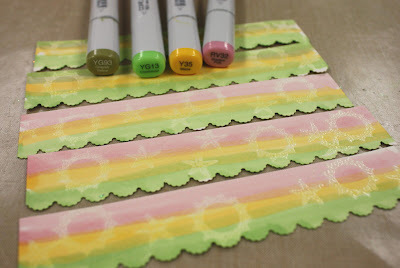 Using the Copic markers in YG93, YG13, Y35 and RV32, I colored horizontal lines across the strips. I used one full swipe across each time and kept on layering the colors, overlapping them a bit to blend them. The more you layers of lines you add, the darker the colors. I'm trying to achieve a certain tropical look that will match another embellishement that you'll see shortly. 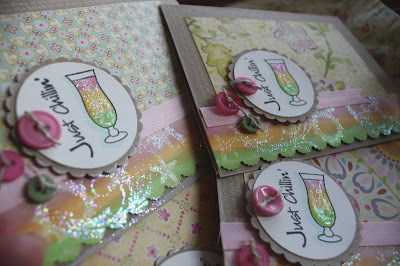 You can see how the clear embossing resisted the markers, leaving some fun sun and star fish elements showing through. 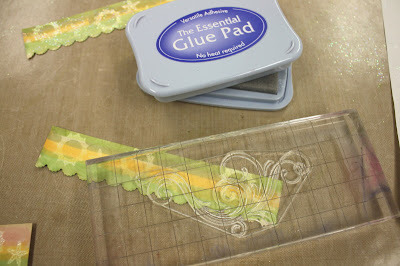 I wanted my embellishments to look a little vintage, so I used my Ranger Distress Ink Pad on the edges of the embellishment strips. Next, I used The Essential Glue Pad and a big swirl from Fancy Flourishes to randomly stamp images onto the colored strips. Very sticky stuff. 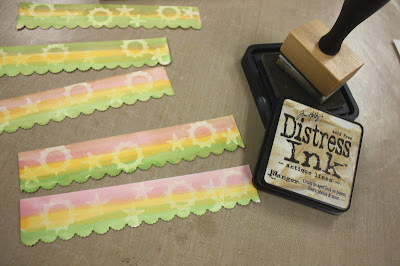 I then dumped Glitter all over the strips to cover the stamped swirl images. I tapped off the glitter and gave the back of the strips a good flick with my fingers to remove the excess glitter. 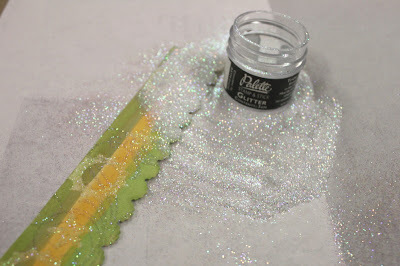 And here's my finished glittery embellishment strips. The Copic colors I chose match the patterned paper(K & Company Wild Raspberry) I'm going to use for my finished projects. Zoom in on any photo to see the glittery details better. 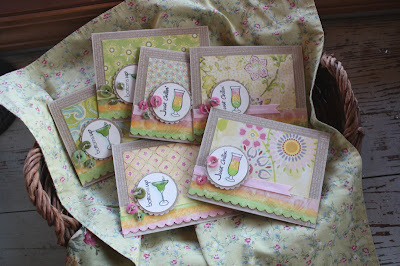 Next, I created some fun focal point embellishments for a few summer time cards. I used more fun images from Day at the Beach to create a tropical drink theme. I did margaritas that have glittered rims for the salt and a cute little lime. And for the other drinks, I used colors from the embellishment strips to create a layered, fruity drink with more glitter for added sparkle. I want one!! 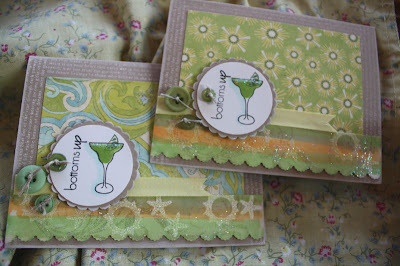 And check out those cute sentiments...just chillin' and bottoms up...too fun! Vintage Buttons tied with twine finish off the embellments that have been punched out with circle punches. 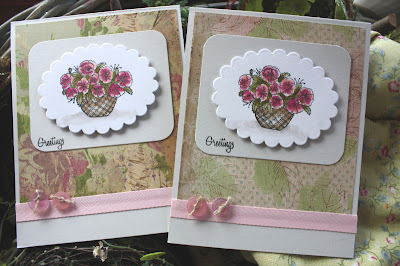 And here's a fun basket full of finished cards. Be still my sun loving heart! For all of the cards, I used a Kraft Cardstock base that has been stamped with a Background Basics: Text Style font stamp in Fresh Snow Ink. The edges of the cards were inked with Fresh Snow ink right from the pad. Rectangles of various patterned papers adorn the center of the cards. 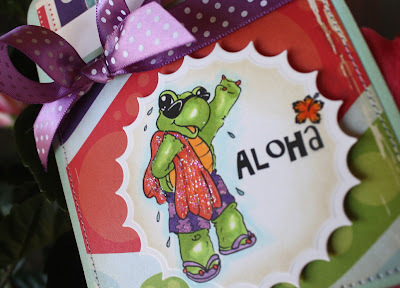 I love that these cards have a fun, tropical feel to them but that I was able to use more muted background papers. Here's a close up of the glitter strips, the circle embellishments, more tied buttons and a snippet of Sweet Blush Twill Ribbon. Yummy little morslets of goodness! 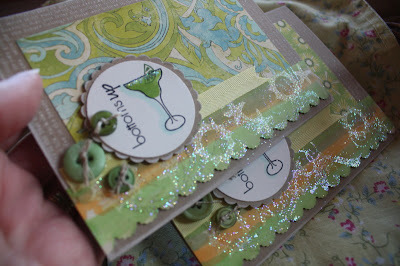 And here's my margarita themed cards using green background papers and Vintage Buttons. Do you know how much I love margaritas? Lots...but I haven't had one in ages!! And a close up shot of more glitterfication (new word). You should see these in person because it's so hard to capture them in photos! Come on over, we'll have a margarita...along with chips and salsa! So bring on summer!! Turn on some Jimmy Buffet, slip on your flip flops and enjoy a nice cold tropical drink. 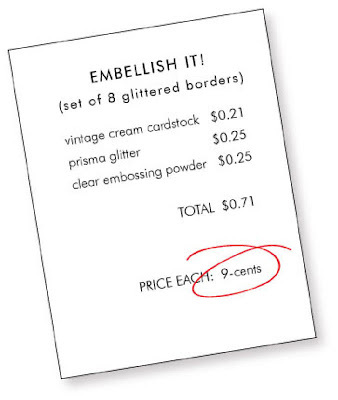 Annnnd, check this out: Nichole did the math for me and guess how much my glittery embellishments cost to make? NINE CENTS EACH!! That's a dime with change left over, peeps! If I were to go buy my glittery embellishments along with the circle images, I'd pay well over $5 bucks for that package. I think I should treat myself to a margarita with all that money I saved! The products Nichole used to figure the cost were consumable products, the rest were items you most likely have in your stash like stamps, the inks, punches, etc. 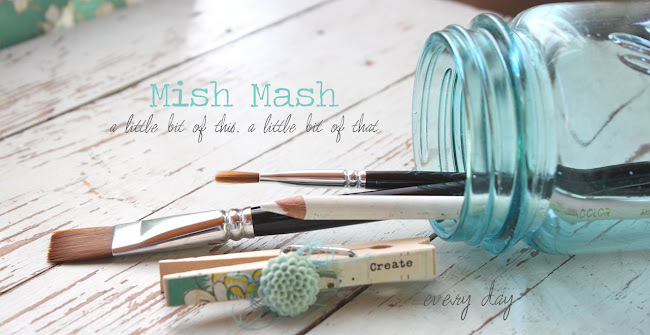 So go make some some fun embellishments of your own, it just takes a little creativity. And if you want to be even more inspired, be sure to visit the other PTI Designers' blogs. Kelly Lunceford is playing along too. Have a great summer everyone! I'm very, VERY excited for the June Release at Papertrey so stay tuned!! Let's call this the Sunday Evening Post. I hope you've all had a marvelous weekend. For me, the days of summer all blend into one big happy event. It's like living in a Norman Rockwell painting at times and I feel so blessed to live right where I do and to have the family that I have. I have to say that May is probably my favorite month of all. To start off, there's Mother's Day and my birthday and I get totally spoiled with my favorite gift....flowers for my flower beds, new trees, and lots of veggies for the garden. I just LOVE my flowers!! Then, it's time for the girls to be out of school. I don't have to work at school either because I'm a substitute teacher, yeehaw! The lazy days of summer are upon us....but it doesn't seem we sit down much. Softball season then begins and looky at my girls. They're sporting new uniforms for our brand new team that my husband coaches. We're called the Dirt Divas...Josey hates that Diva part because she thinks it's too girly. We tease the men folk that sport the coaches shirts. We call them things like Mr. Diva, He-Diva, Diva Dad, and Diva Dudes. We won our first game last Friday....pretty good since we thought that the 13-16 year olds we played were 12 year olds like our girls. A little mix up there with this practice game but the girls thought they were totally cool when they won!! I did too. And then there's the grillin' and chillin' outside. Oh...my.......BBQ-ness!!! Was this little Grill Packet ever so delicious tonight!! I could barely make room for fresh corn on the cob. Holy Shades of Yellow-ness, was this good! Eric and Josey prefer to eat theirs on the cob. Eric is a corn eating machine and it's best not to sit next to him on corn on the cob night. You might get your fingers eaten off. He mows the corn down...it's like watching one of those old fashioned typewriters go back and forth. I swear some day I'll hear a *ding* when he gets to the end of a cob!! Jordan and I prefer ours cut off neatly with a knife.....and the more big slabs of corn you get the better. And then comes the garden goodness. My neighbor Rhonda gifted us with home grown strawberries. It's been years since I've had home grown ones. Heaven on earth, and look how cut the little stems are. Oh and please zoom in to capture the mouth watering plates of goodness below.....Homemade Strawberry Shortcake....on my new yellow plates that I got for my birthday. I like to mix up the strawberries and sugar early in the day so that there's lots of sweet syrup to pour over the shortcakes. You seriously need to make ya some Strawberry Shortcake, peeps. Well, I'm headed outside to walk around with my family..we like to view our gardens each night and have fun before Eric has to go back to work tomorrow. 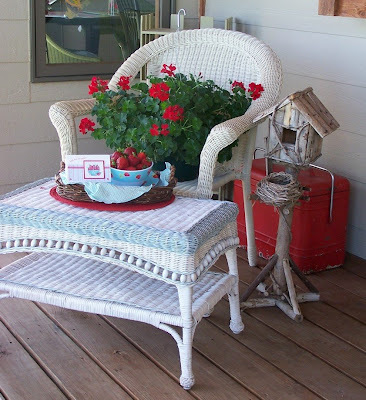 I've got me a few new projects that I want to do which involve moving a bunch of rocks, creating some rock benches and trying to find a spot for a new strawberry patch. Easy livin' is the life for me. Now, I'll be back later to announce the winner of the Copic prize. And tonight at 11:00pm Central Time, you'll be able to see the Papertrey Challenge for June. The summer fun continues, you won't want to miss it!! See ya soon. Recently at Walmart (the place I really don't like to go to but don't have many other options), I found these assorted, white and milk chocolate covered pretzels. The packaging wasn't the prettiest but the pretzels did look pretty darn good. So for $3 bucks a package, I bought these two...white chocolate with mini chocolate chips and milk chocolate with chopped peanuts. With tax, they're about .37 cents each, not too shabby for some quick little gifts. And look, they stay good til 11/24/09!!! That made me laugh, who knows what they put in the food these days. So anyway, I came home and after testing each pretzel to make sure they were gift worthy..and they are......I decided to make some treat sacks. We're out of school already for the year but these would make wonderful teacher treats. 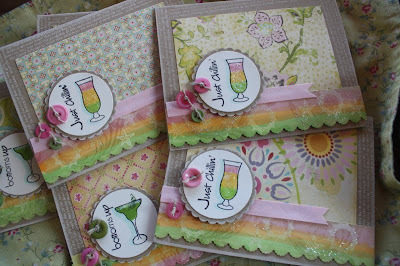 I used JustRite's What's Cooking Borders and Centers stamps to create a cute, circle tag for some little pocket cards. 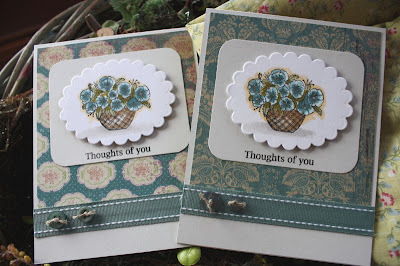 The finished cards measure about 3.5" x 4.25" with a little insert to write a thank you note, birthday message, etc. 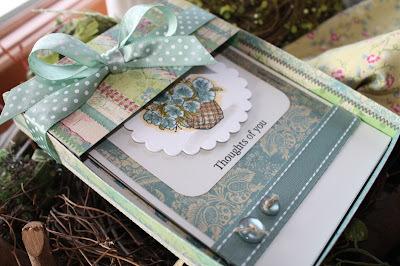 I used K & Company patterned paper for the card front and Papertrey's Spring Moss Satin ribbon, some Dark Chocolate buttons and twine also. Sorry to digress there folks.......but you need to make some little treats like this. I know many of you say this: I don't think that way if I would see those pretzels at Walmart in the ugly packaging. Here's what you need to do: Always be on the lookout for things that can be re-packaged in another way. And have little gift wrappy stuff at home like glassine sacks, clear bags, ribbon, tags, etc. The JustRite stamps are perfect for little tags of this nature because they're quick and easy to punch out with circle punches or cut with Nestabilities. 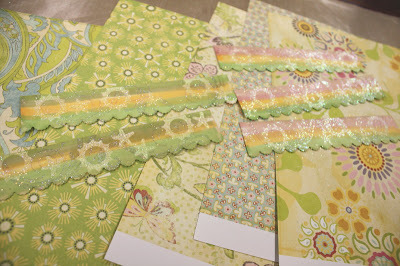 You could also pair the tags up with any of Lauren's Papertrey Timeless Templates, they would be perfect! And you don't have to spend a fortune, it's the packaging that makes all the difference. Think how fun this little treat sack would be for a little hostess gift or a take home dessert for visitors....or on a pillow of someone visiting your house. It's those little things that make people severely jealous of your craft skills...use it to your advantage girls!! Have a great weekend! 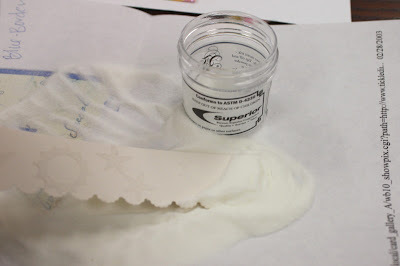 And remember to visit Debbie's blog today for a chance to win a Copic airbrush system! And leave a comment on my post yesterday for a chance to win some Copic Multiliner markers. I'll do my drawing on Sunday night! Labels: Gifts, JustRite, K and Co.
Hey everyone, let's start today with a little prize drawing. 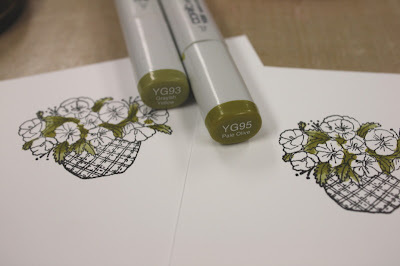 If you read down two posts, you'll see that Marianne with Copic is celebrating her 1 year blog anniversary this week. Today's my turn at the give away and I'm offering up a set of Copic multiliner markers, pictured below. I will run the drawing through Sunday 8:00pm. You can enter the drawing by posting to this blog post, just leave me a general comment or better yet, let me know what you'd like to see done with Copics. I'll pick a winner on Sunday evening. Be sure to leave your name and email address in your comment. Anonymous posts will not be accepted. Thanks for playing along. Multiliner SP 4pc. set, black, assorted sizes Now for today's post, I have some wonderful cards to show you that are for my mom's birthday coming up. I know she'll love these K & Company papers below, so they were the starting point for my color selection. I'm working with Karen Lockhart's new Rose of Sharon image. Karen does the best flowers!! I'm going to show you my coloring progress as I go along. I started with the leaves and used two tones of green markers. The left image shows the YG93 that I went over twice to get some deeper shades of color. The right image shows the finished leaves using YG95. Below are some flowers that I did in blue tones. I had to google some photos of Rose of Sharon flowers because I wasn't sure of the colors. They come in a variety of colors from blues to pinks and whites with beautiful pink centers. The flowers themselves resemble a hibiscus flower. The image on the left shows my first layer of BG10. 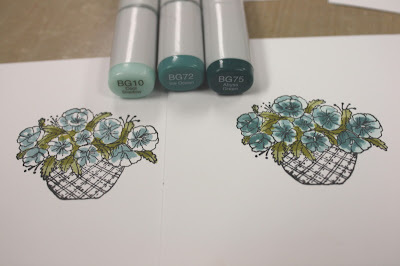 The photo on the right shows the flowers after using the BG72 and BG75 markers. I like to leave some white or almost white areas in my coloring. Those little specks of white are good....my high school art teacher always told me that. And below are the colored baskets, the left side showing E31 and the right image showing some deeper tones that I achieved using E55. The photo below shows some shadowing that I added using W1 and W3 and the blender marker (0). 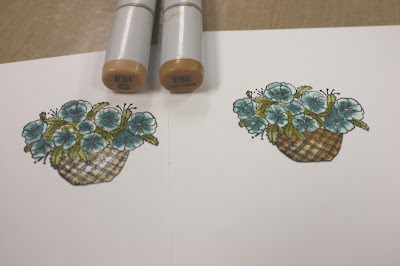 The left image also shows an outline I did around the flowers using a YR31 yellow marker. That yellow really helps the flowers to pop off the page. I achieved the same look using shades of pink in RV42, R85 and RV19. And here's my finished cards below. I used a Spellbinder's Oval Nestabilities Die to cut out the images. 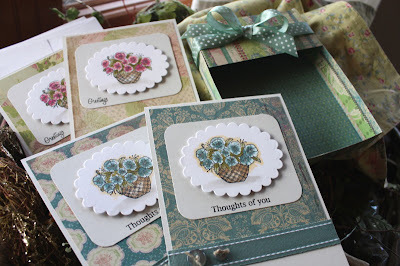 Sentiments, ribbons and buttons for all cards are from Papertrey Ink. And here's my blue colored cards. And check out the glitter atyou Spica pens from Copic. They are SO shimmery and pretty. Here's my little assortment with envelopes, all ready to be packaged up for my mom. I like to keep the sentiments generic in nature so that she can use the cards for any occasion. And since my mom has a hard time using any of my *too pretty to be used* gifts, I thought that Lauren's Desktop Organizer Timeless Template would be perfect. It's open so that cards can be slipped in and out....she can keep the box pretty but still use the cards. I love this template, it's one of my faves. You just print them off...cut on the solid lines.....score on the dotted lines....and assemble. And this box is sturdy so it will hold up well. Easy peasy for a girl like me who never likes to measure or read directions . I'm hoping to stamp up a few more cards for my mom so she'll have a few refills on hand. We'll see how long this gift sits before she uses it. Gotta love our moms. Wowzers, TWO posts in one day! 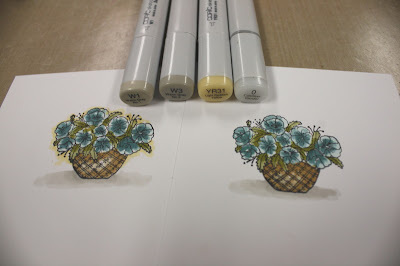 Be sure to scroll down to my first post today to celebrate with some Copic fun!! Today is my friend Joy's birthday (from Eclectic Paperie and Our Craft Lounge). She is such a sweetie and boy oh boy is she gettin' some birthday love today! Check out Cami's blog HERE to read all about Joy's special surprise. She loves this new Our Craft Lounge Hangin' Loose with Kona set which is available now at Eclectic Paperie. 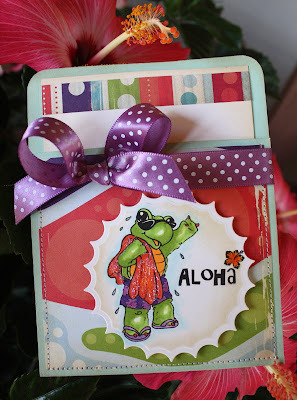 This little turtle is so cute and perfect for summer time cards and projects. 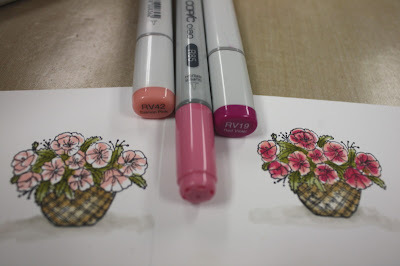 Marianne Walker from Our Craft Lounge (and Copic) illustrated this set, way to go Marianne!! I colored in my image using Copic Sketch markers, using Cosmo Cricket's Snorkel patterned paper as my color guide. I love the fun fruit-punchy colors. Since the Snorkel paper was distressed looking, I inked up my image with a Ranger distress pad to give it a little tan color. 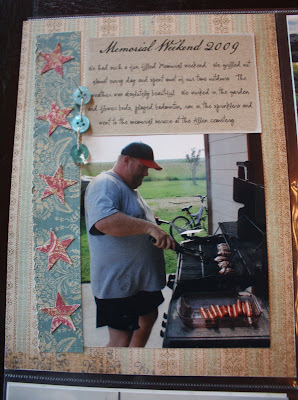 I cut my image out using Spellbinder's Inverted Scalloped Circle Dies. I love them for summer-y projects, the shape reminds me of the sun. I finished off my fun pocket card with some machine stitching, juicy, purple Papertrey ribbon, an insert card with some more Snorkel patterned paper and glitter on the beach towel. What a fun card! I'm a little late to the party but I'm so glad I got to participate today. Happy Birthday Joy!! 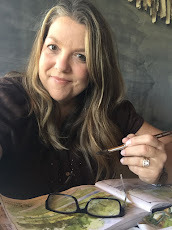 Announcement: Marianne Walker, Product Specialist for Copic Markers is celebrating her one year blog anniversary this week. Please visit her blog HERE to see what she has cookin' and to congratulate her on her fabulous year of blogging!! 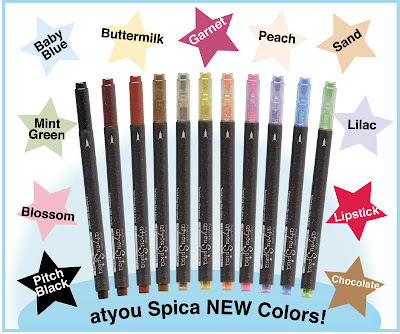 And here's something else to celebrate....there are now 11 new colors of atyou Spica glitter pens. The atyou Spica pens are prefect for adding a subtle shimmer to any of your papercrafting projects. These pens are acid free, archival, and pigment based. They last twice as long as any other glittery pen and are not a gel pen. They're really hard to see in a picture, so you have to see them in person to understand how they work the best. Trust me, they're awesome! Sally Lynn will be drawing tonight so head there first. Fri, May 29 - Sun, May 31: I'll have a special little something for you, so visit the blogaroonie tomorrow! Happy One Year Anniversary, Marianne!! Edited to add: I forgot to mention my Copic Charts that a reader asked about. Unfortunately, my word document was lost when we had some computer trouble so I don't have them to share. But they are super easy to create: Open a word document and create a table with 4 columns and rows to fill the 8.5 x 11 sheet. I printed a title at the top and left the table blank. You can go to Copic to see their chart and fill in the markers #'s in order with a marker. I added ALL of the colors to my chart.....a girl can dream that she'll have the ENTIRE collection some day, right? Star Prints was one of my favorite sets from this month's release at Papertrey. Stars are everywhere right now so Nichole really created this set at the perfect time. The patterns in the stars and the fun curly-q sentiments are perfect together. While at my friend Carmen's house a while back, I was making some cards for the track coaches using our school colors of black and white. Using some of the leftover supplies, I stamped up some card bases. It was the first time that I had used the Guidelines Cardstock and let me tell you......it's amazing! You don't have to limit yourself to the Guidelines and Guidelines Two stamp sets when using this paper. I effortlessly was able to stamp the stars in an even pattern, then add smaller stars and sentiments in the leftover spaces. A great addition to our paper collection! Fast forward...I needed two more graduation cards. I dolled this one up with pink and black accents for a girl, using Vintage Buttons, Swiss Dot Ribbon and glitter. And I kept this male version very simple by adding some black distressing to the cardstock edges and some Soft Stone cardstock. 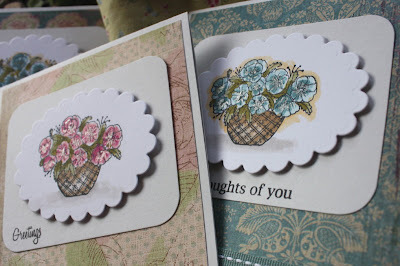 Super fun little finds that making stamping easier......gotta love it! Hi everyone, we had a great three day weekend! We spent most of our time outdoors, spending time in the flower beds and vegetable garden, adding a new pumpkin patch, grillin' some dogs and burgers and just enjoying the good times. 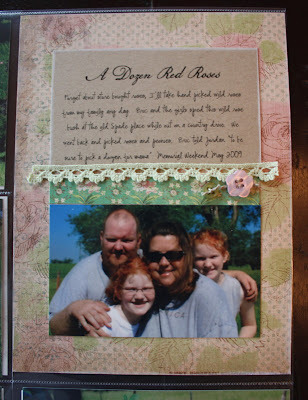 I was even able to squeeze in a little scrapbooking, thanks to some new page protectors from We R Memory Keepers. 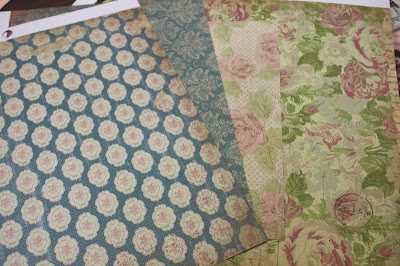 I found 4-5 different styles at my local scrapbook store. 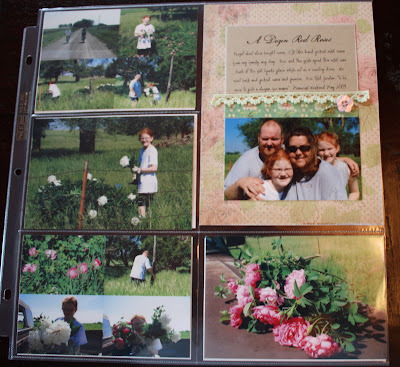 They make for FAST scrapbooking because they allow you do some *blended* scrapbooking....combining traditional scrapbooking along with just dropping the photos in the plastic sleeves. I still will do my regular 12 x 12 pages, but I'm adding in lots of these quick pages too. Here we are below picking wild roses and peonies. Eric and the girls spied the bushes at an old homestead near our house. 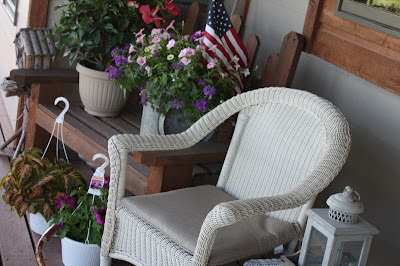 We went back and picked lots of flowers for Memorial Day flower arrangements for the cemetery. Eric told Jordy *to be sure to pick a dozen roses for Mom*. Here's the scrapbooked portion of my layout. It measures 6" x 8" and I included a photo along with some computer generated journaling. And here's the flip side of the page above. 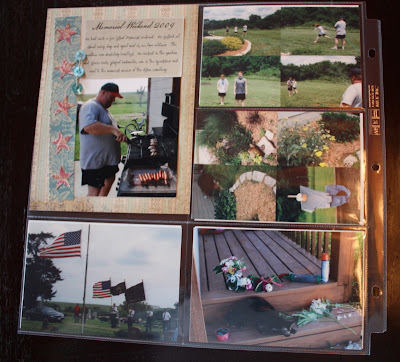 This showcases some photos of Eric the grill master, the girls getting sprayed by the hose, some of our flower beds and the beautiful flags at the Memorial Day service at the cemetery. It's a family tradition for us to place flowers at the cemetery and to watch the memorial service and to honor those that have served for our country. Here's the 6" x 8" layout for this side. And a little tip for you: You may be tempted for a layout like this to use bright, red, white and blue papers to reflect the Memorial Day theme. But remember to take cues from your photos instead. I kept the colors more muted to match the colors in my photos. I'll save those brighter colors and patterns for my cards or future pages that might have those brighter colors. Well, it's back to the grind today so I better get a movin'. Today would be my brother Jeff's 42nd birthday if he were here. I remember that my mom would always make us a birthday cake and we'd celebrate our birthdays together in cute little matching outfits. Our birthday dates were one week apart and it was always such a fun time. My mom made the best cakes too....always something fun like a caterpillar, butterfly or train.....the shapes cut from one sheet cake. I bet your mom made those too! Hope you have a great day everyone! While making a list of card refills I needed for my stash basket, I noticed that the Get Well Soon section is always empty. You ever have those times where you need a Get Well card but not a real formal one? Maybe a card for someone who needs some good ol' rest and relaxation to make them feel better? 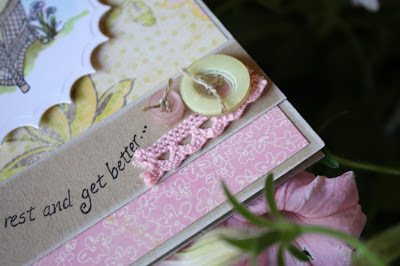 Karen Lockhart has one of my favorite sentiments for get well cards.it reads *get comfy, rest and get better*. It's perfect for the kinds of cards I'm talking about today. 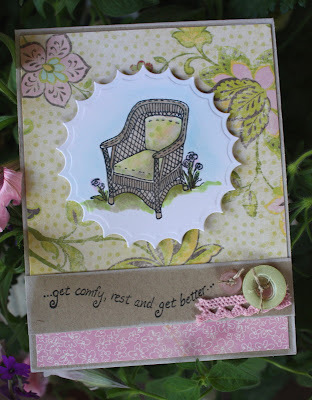 And when you pair it up with Karen's Wicker Chair stamp, you've got a perfect combination. I colored the image with Copic markers and then went over a good portion of the coloring with a warm grey marker (like W3) to tone the colors down a bit. I cut my image out with a Spellbinders Inverted Scallop Circle Die Template..to kinda give the feeling of a big sunshine. I combined my image with K & Company Wild Raspberry paper, PTI Kraft Cardstock inked with Fresh Snow, buttons tied with twine and a little snippet of pink eyelet ribbon. So soft and pretty. 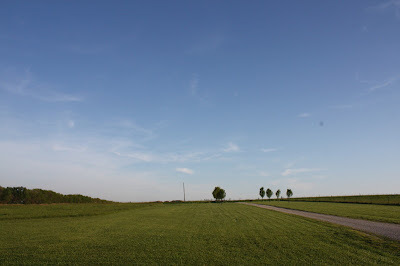 .......and do nothing but stare out into the bright blue sky. Doesn't hurt to have a good snack near by too....like fresh strawberries.....and maybe a good friend. Hope YOU are feeling fabulous today!! Thanks for stopping by.